After you install a service pack, you more than likely don’t want to uninstall it. If you do, then this tip isn’t for you. 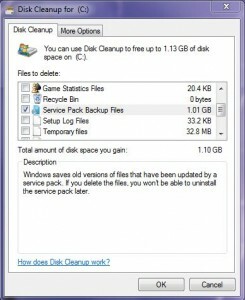 However, leaving the service pack uninstall files on your hard drive can take up valuable space. This tip shows you how to get rid of them. NOTE: You will not be able to uninstall the service pack after doing this. 1. Go to Start > All Programs > Accessories > System Tools. 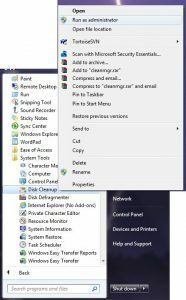 Right click on Disk Cleanup and click Run as Administrator. 2. 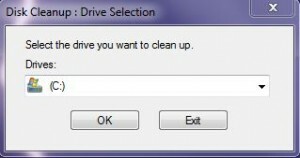 Select the drive where Windows is installed (Usually C:) and click OK.
3. Once the scanning is finished, you can select anything, but to delete the uninstall files from the service pack, choose Service Pack Backup Files and click OK.
4. It will take a few minutes to clean up, but it can save you quite a bit of space. Next post: Steve Ballmer Sells Out!